I know that I’ve slacked in the department of product reviews since getting busier, but I am hoping to fix that in the near future and trickle out reviews of some of my favorite things or at least compile them into the TRIED and TRUE posts. This is going to be more of a story of how our life evolved with the product than an actual review, but in so writing about it, you will get a good idea whether you might enjoy this product as much as we did or not. This particular item has sneakily made its way into our life in more ways than I anticipated. 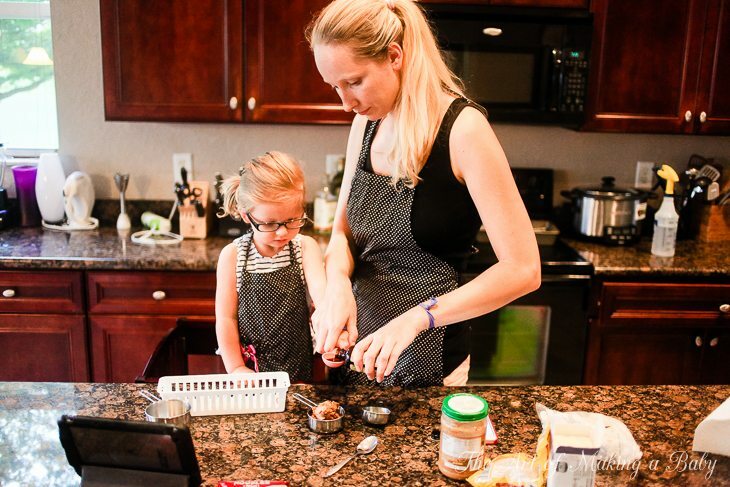 We had featured a Kitchen Helper on Daily Mom, right at the time when I was struggling to keep Lexi occupied while I cooked. I had also heard good things about it from MULTIPLE people. So I thought it was a worth product to try and see if it solves our little problem. Our first test was Easter Cooking out of all things. 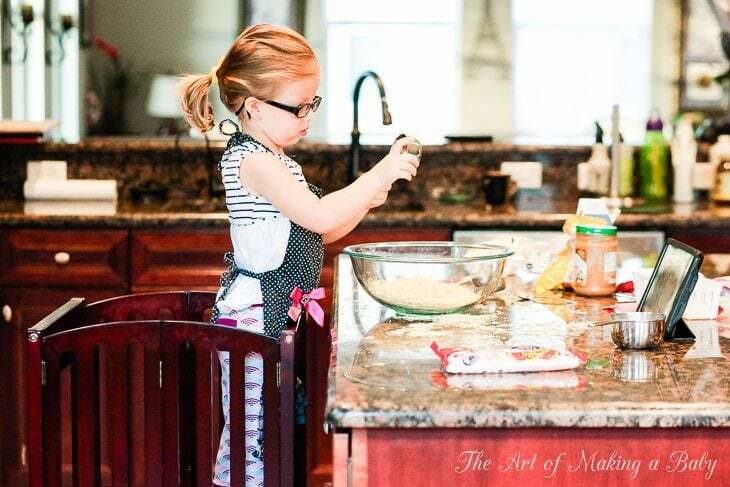 I took an egg nest recipe from Daily Mom (of course), Lexi and I put on our favorite Mommy and Me aprons and we started cooking. 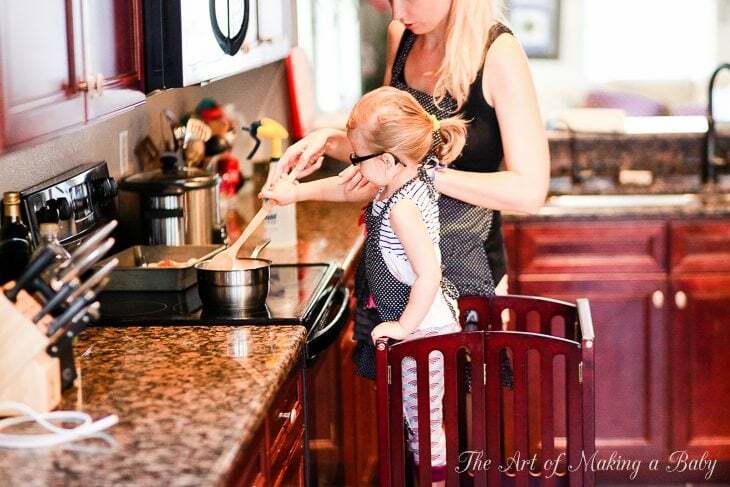 Up until that point, I had attempted cooking with her, but it’s a little bit unsettling wielding knifes and working on a hot stove when your barely two year old is balancing on a chair. So I quickly gave up, not wanting to make cooking even more complicated and stressful than it was. Fast forward to later, and with the Kitchen Helper, one thing was OFF my mind – her safety. Even near a hot stove I can put the Kitchen Helper far enough away that she won’t reach it, though at this point it’s not necessary as she understands danger better. So back to Easter cooking, we spent quite a long time cutting butter, mixing things with our hands, measuring, stirring, assembling. It was kind of wonderful, to be honest. Our egg nests turned out horrible. I can never follow recipes well, but that wasn’t the point. It was really fun. Then we tried making homemade dough together. Over and over again. At this point, Lexi knows the recipe so well, she can make it herself if I bring out all the ingredients. 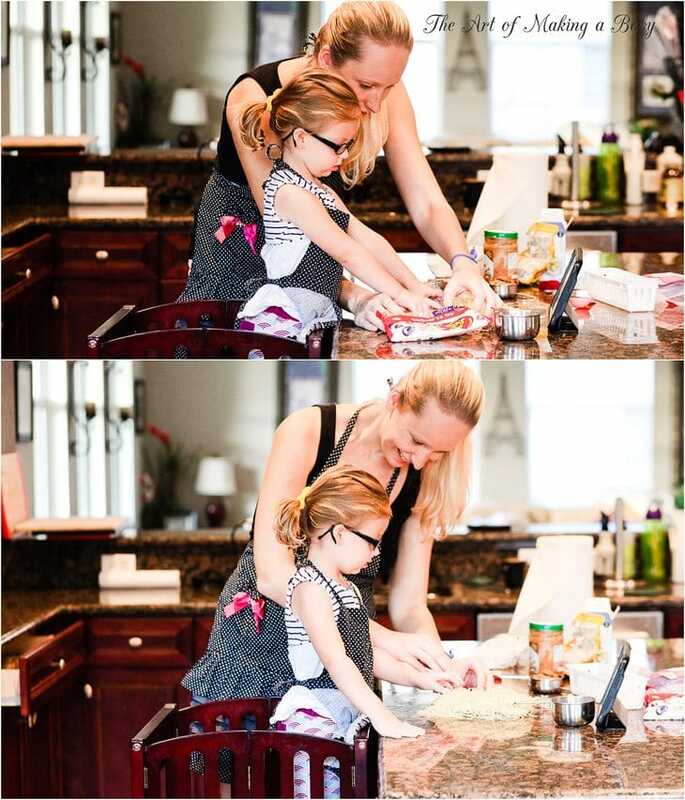 We have cooked together many times since, especially when I needed to keep her occupied. She has always done it with joy and that busy toddler look and moves that are just so endearing. 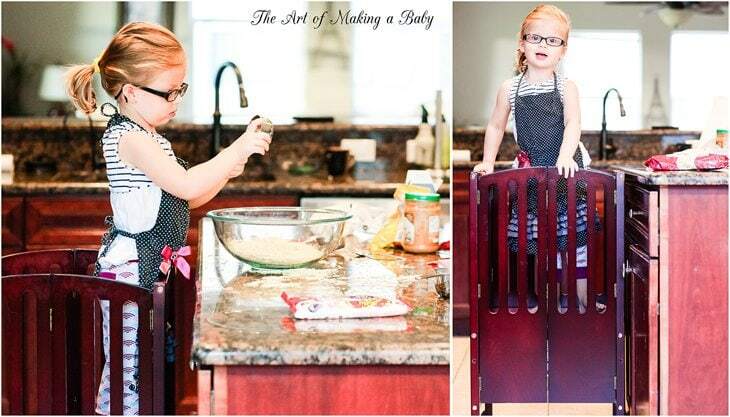 Soon the Kitchen Helper evolved into a hand washing tower, dish washing stand, produce washing stand, fruit juicer stand. It has become a true kitchen helper. 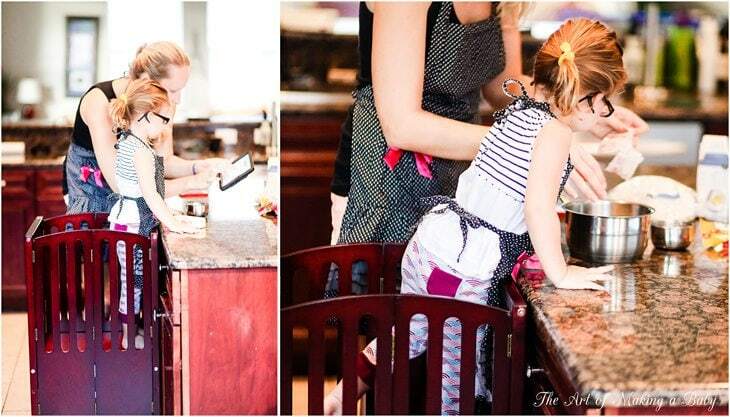 The truth is our kitchens are created for adult height (obviously) and it’s hard for little ones, even with a step stool, to get anything done. At this point, I can easily move her up to the sink in the Kitchen helper, turn on the water and let her wash her hands for as long as she wants. I know she is safe. And I have a few minutes to get her food ready or clean up. And we wash hands A LOT. Multiple times a day she runs to her painting table and paints. She gets paint all over her hands. She then runs into the kitchen and says “Mama, I’ll be right back to wash hands! Good Bye!” in this really business-like tone. And when she is done, she climbs into the Kitchen Helper and washes her hands (I still have to turn water on for her as she can’t reach the faucet yet). The other day, we had to make some vegetable soup, and that takes a long time with cutting and washing veggies. So I gave her the task of washing them and, oh my, how much she loved washing, shaking water off and then cutting veggies with me. So yeah it’s pretty amazing! Enjoy the pics! I’ll be back with more! 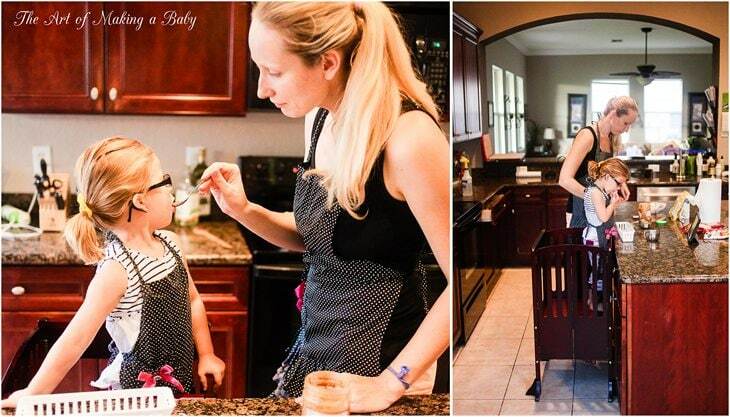 Love cooking with toddlers! My almost 2 year old uses a wavy chopper tool and can help chop softer foods with it (it requires him to put both hands on top, and is pretty dull, so there’s not a lot of danger of him getting cut). We didn’t have the funds to buy a learning tower/kitchen tower so my husband made one from a wooden Ikea stool and some wood that Home Depot cut to size. (Google Ikea learning tower hack for lots of ideas). Both items have worked out great. Very helpful review. My 2.5-year-old has loved helping in the kitchen since I was still wearing her as a baby, and I never even thought of something that keeps her contained since she doesn’t fall off her chair (which she loves to push around from one part of the counter to another), but being pregnant with a second I’m imagining s/he won’t be the same and something like this could be a lifesaver. 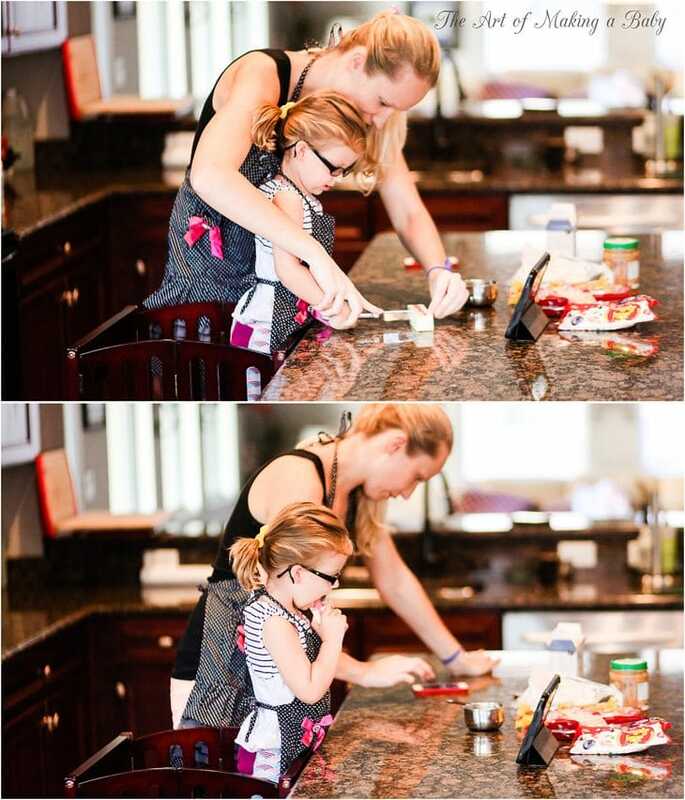 Either way, cooking with toddlers is one of my favorite activities! So much exposure to science, art, and the senses. Thank you for covering it and I love the pics. this thing looks huge! i finally have a big kitchen so my daughter can help, but i would not have room for this thing. i guess it’s ( also looking at the price) nothing for the ‘average joe’. Love ours (different brand)! It was earlier than the product recommendation but we have had it since 15 months. I can’t imagine going without it all this time, it really does help make everyday tasks into a fun activity to do together. He’s been “helping” me with meal prep, washing dishes, baking since about 18 months and it has really encouraged involvement and self-sufficiency. So much safer than a stool or chair, too! “My little kitchen helper” — I thought you were sweetly referring to Lexi, till I realized that’s what the product was called. Lol, it’s still early for me here in California. I am so torn on this product. On one hand, it does it’s job well- keeps kids safe. Can’t argue against that. But in the other hand, the price seems so extreme (for those of us who can’t get it for free- lucky you), and for my 2.5 year old, seems to go against each ing him rules and consequences. I think the price is reasonable when compared to some other crap on the market with a similar price range, but of course it’s not in everyone’s budget. I would definitely forgo some other stuff (toys) to get this if I had to and knew what I know now. Lexi has never gotten hurt majorly because we watch out for it, yet she still knows boundaries and cautiousness in situations where it is warranted. They learn it eventually regardless of whether we let them fall or protect them until they have better handle on their balance. These things are great. For people worried about budgets, i found mine locally by a man who makes them for $50. Check around local sales and Craigslist! My almost 2 year old boy loves his. Elena, what happened to your 52 weeks of experiences series? It was fun to follow along. It’s happening, I am just not blogging about it. I took a break when we were travelling for a month, because that’s enough experiences, but now we are back. For the less fun ones I didn’t take the camera with me and then ended up not having pictures to post, so I figured I would combine some of the funer experience and blog maybe once a month, as well as catch up on the previous postings. After the holidays, obviously. 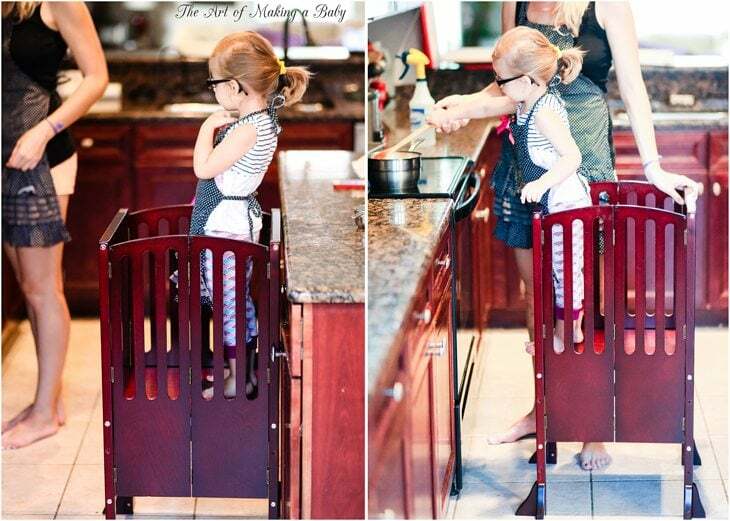 haha it’s like a car seat for the kitchen…how cool! It’s a bit on the pricey side but for my sanity of not having to worry about my daughter falling it seems like it may be a good investment. Thanks for the review!